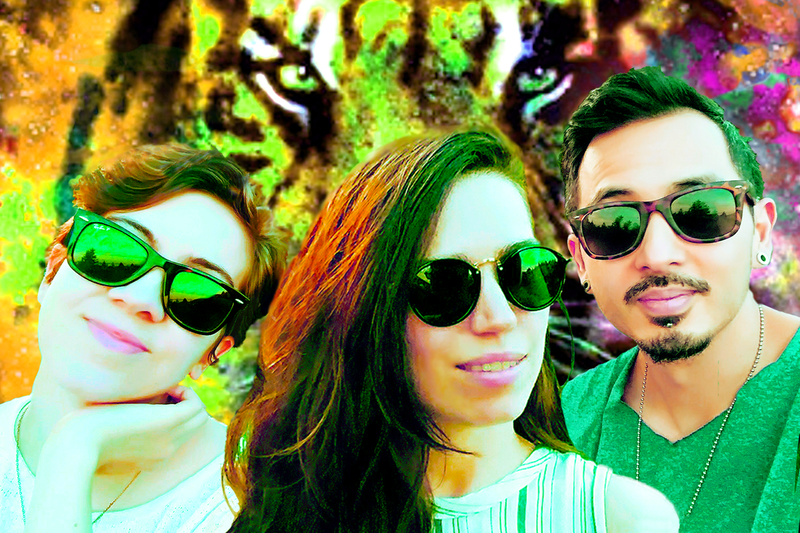 Our latest musician spotlight features Kaeili & The Tyger, a new Vancouver Indie band that carries a unique beat driven, alternative-pop sound. The trio will be playing at Trees Organic Coffee & Roasting House (Granville Street), August 24, 2018, 8 – 10pm, as part of the Vancouver Live Music nights on Fridays. Kaeli & The Tyger joins together the talents of singer-songwriter Kaeli McArter, multi-instrumentalist Brian Africa, and the harmonic Emily Morris. 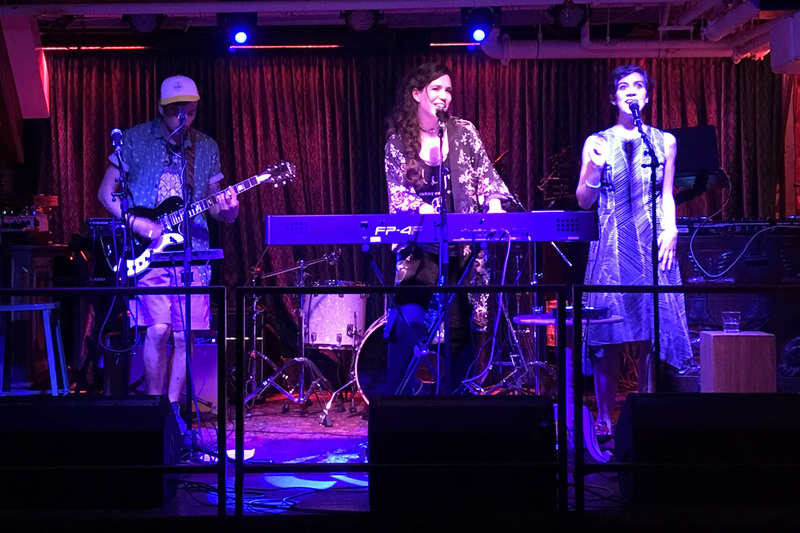 This is a three piece band that stacks Kaeli’s and Emily’s vocals with keyboard synthetics, guitar, and hand percussion – a combo that creates energetic tunes and will have you tapping to the beat, and humming along. Kaeli McArter is shining as an emerging artist both as a member of Kaeli & The Tyger, and in her solo work. She grew up on the North Shore, and Sunshine Coast before re-committing to her Vancouver born roots. In her youth Kaeli developed her musical skills through self-learning, as well as piano and voice lessons. She’s a singer-songwriter that has been penning songs since her early teen years. Writing songs is such an important part of her journey. 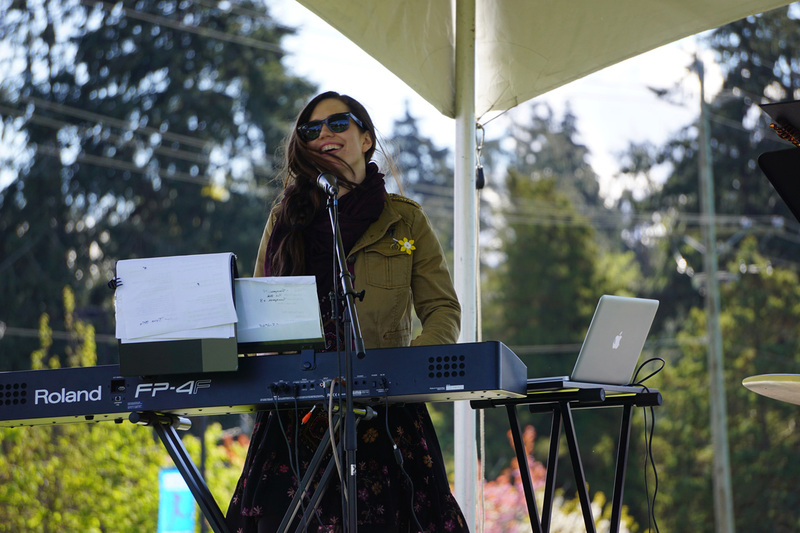 While attending University of British Columbia to complete her undergrad for Environmental Studies and Sustainability, she convinced her professor that an originally written and recorded song would suffice over a term paper. Kaeli likes her melodies to take the listener on an emotional journey. She’ll have you soaring one moment to feeling quietly intimate the next. She describes finding her sound after encouragement from Tom Petty’s music producer, Ryan Uylate, told her to use her voice as an instrument. It’s primarily voice you hear at the beginning of her song Nobody’s Fool. As a group, Kaeli & The Tyger started out singing informally with fun cover songs. They’ve grown in performing together, and now the trio mainly performs original songs. The band enjoys playing summer festivals and local gigs. We caught up with Kaeli to learn more about her and the band. Learn more about Kaeli & The Tyger below. TO: Who is Kaeli & The Tyger? Kaeli: “Kaeli & the Tyger” is a new Vancouver band that fuses singer-songwriter Kaeli McArter (me) with multi-instrumentalist Brian Africa and “harmony queen” Emily Morris. The 3-piece band layers our vocals with keyboard-synth, guitar and hand-percussion to create the band’s unique beat-driven alt-pop-soul-electro songs. TO: Tell us how you came together to play as a group? Is there a story there? Kaeli: I was performing solo when a friend introduced me to Emily (Em). Em is brilliant at harmonies and plays tambourine and egg-shaker. We played around with a couple mashups before doing my originals. Then Brian met Em and me at one of the Thursday Open Mic Nights hosted at the Trees Organic Coffee cafe. Trees literally brought us together, so the cafe has a very special place in our hearts! Brian is equally passionate about music and a wonderful multi-instrumentalist. All three of us have a great time playing together but Brian also performs solo as do I. And when the three of us aren’t gigging together, Em is pouring her creative energies into film. She helped secure the location for my music video Dance to Anything and enlisted part of the crew. Em is one of those people that can just make things happen. TO: What is the focus for the group? Do you mainly perform original music/or cover songs? If original who writes the music, what do each of you bring to the performance? Kaeli: These are early days and we’re performing together now more and more. We love Trees, we have opened for a band at the Belmont, and we are also doing a couple of smaller musical festivals this summer. When we first got together, the three of us jammed informally and did some cover mashups. But I love to write songs and so we started doing some of my originals. Now we do almost all original music with a couple cover mashups thrown in for fun. In the past I’ve written solo and also worked with a Canadian co-writer back east and another co-writer in California. The next step for us as a band is to start writing together. In terms of what each of us brings to a performance, Emily is an absolute wizard at harmonies, singing and hand percussions. Brian primarily plays guitar in Kaeli & The Tyger. I usually do the lead vocals and play keys. The three of us love music, performing and also really like each other as people, which I think it pretty important. TO: Has the group recorded any songs or albums together? Kaeli: The band hasn’t recorded anything together yet — that’s been a solo trek for me over the last couple years. I was actually in LA last week attending a music conference on sync-licensing original songs to be placed in TV, film, and ads. I met and networked with some great people there, learned a lot, got great feedback, and was very inspired to keep on writing and singing, not just for Kaeli & The Tyger but also for film and TV. TO: Are you a full-time musician/performer? Kaeli: I currently have a part-time day job but I aim to do music full time eventually. Right now I have say that I have the best day job on the planet. I work for an amazing writer in the film industry who is one of the most creative people I’ve met and inspires me on a daily basis. My boss is super supportive in encouraging my music career. I feel very fortunate! TO: You’ve got a lot going on, when it comes to your solo music – what is new, what is lighting you up, what should we know about? Kaeli: I just finished writing two songs last month and I’m excited about going into the studio to record them. After that, the next step is doing another music video. It won’t be as complicated as Dance to Anything but will be as good in its own way. Emily and I have been batting around some ideas and I met a musician and screen writer in LA who fell in love with one of the songs and suggested a couple creative approaches to the video, so I’m feeling inspired. TO: What influenced or helped you shape your sound, which some have described as haunting and cinematic? Kaeli: I love melodies that take you on an emotional journey where you’re soaring one minute or feeling quietly intimate the next. When my voice has been described as “haunting”, I guess that’s when I’m really feeling the emotion in the story behind the song. Also, I was lucky enough to meet Ryan Uylate, Tom Petty’s music producer, who encouraged me to use my own voice as an instrument wherever possible. I’m so grateful to him as this set me on the path of my new sound. That’s why the opening instrumental section of Nobody’s Fool is done primarily with voice. TO: Do you play any instruments? Kaeli: Keys, lead vocals and background harmonies. TO: How would you describe your style of music? Kaeli: So far it’s a fusion of alt-pop-soul-electro. But whatever genres I’m playing with, I’d say my voice serves as a through-line instrument to create background sound textures. I’ve got some raw stripped-down ballads, but my more upbeat, electronic songs have been likened to Sia meets Banks meets Annie Lennox. TO: What inspires or influences your music now? Kaeli: I’ve always loved playing around with different genres. What’s so exciting about the music industry now is there’s a growing movement toward fusion and different sounds. The typical genre barriers are starting to dissolve, so I’m inspired by a lot of the music I listen to, and I listen to everything. One of the cool things about meeting other artists at a recent LA conference is that we all had different styles and approaches. It was inspiring to meet new artists and hear new music. And I’m always surprised and inspired whenever new sounds, melodies and lyric ideas come through when I’m working at home late at night. But for inspiration, I also need to get out and about, hearing snatches of conversations on the street, exploring new places, meeting new people, watching TV and film. TO: Can you tell us more about your EP? Kaeli: I’ve already released Dance to Anything and Nobody’s Fool, the first two singles of my 4-track EP which will be released in November 2018. Thematically the EP covers different emotional territories — from dreams and longings, to disappointments and hopes. TO: You recently filmed a music video for your song Dance To Anything. Can you tell us more about the project and the cool film location – Historic Britannia Mine, here in British Columbia? Kaeli: I chose Britannia Mine because it’s this cavernous space with lots of history. The old main mill room is so large and the building itself is unbelievably big and tall as it climbs up the side of the mountain. The moment you walk in, you feel inspired, and I thought it would be an incredible backdrop for a music video. I was so lucky to be joined by two of Vancouver’s standout dancers, Cara Hrdlitschka and Navid Charkhi. It was a 14-hour shoot with the best crew ever, including some volunteers supporting an indie singer-songrwiter with a small DIY budget. We managed to compress a 2-day shoot into one long day. Creative inspiration ran high, and lots of good vibes and Red Bull saw us through. A big thank you to director David Martin and DOP/editor Ryan Kenny for keeping us on track. 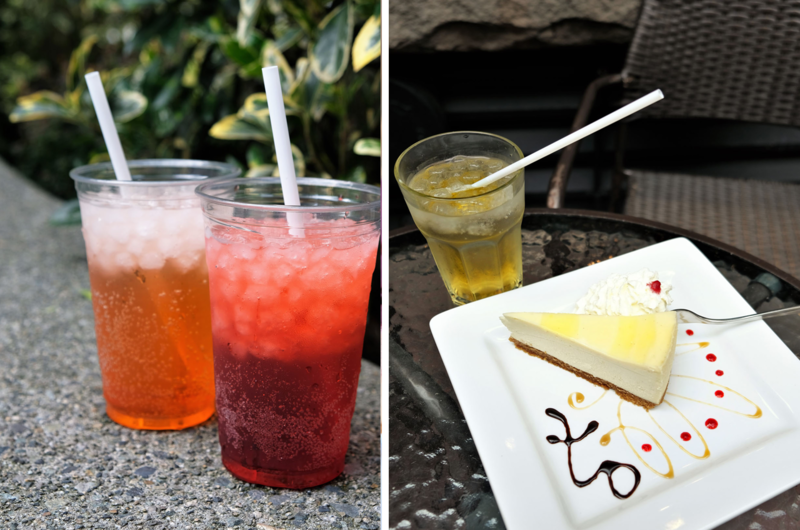 When summer sizzles and you are craving a sparkling drink, try the refreshing fruity bubbles of our cafe-made Italian sodas in two classic styles – regular or creamy. 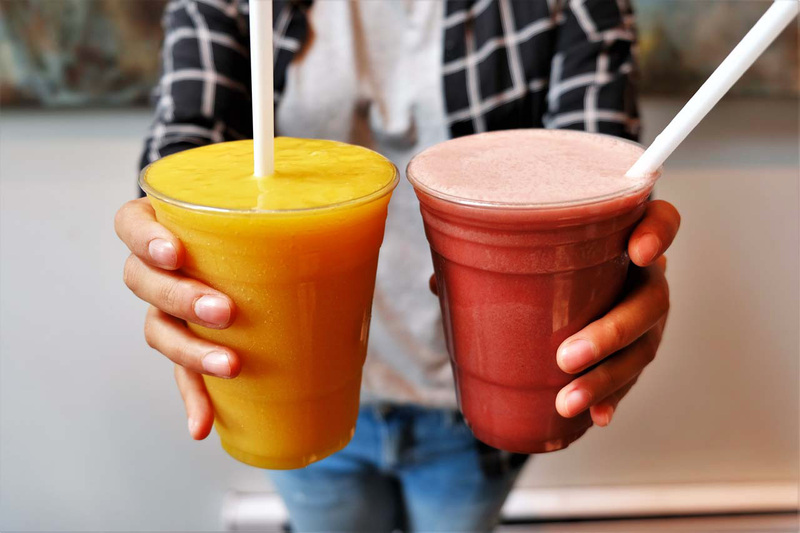 With colourful fruit choices that pop, they’re not just eye-candy but thirst-quenchers with a variety of bright flavours to help you kick back and keep cool! 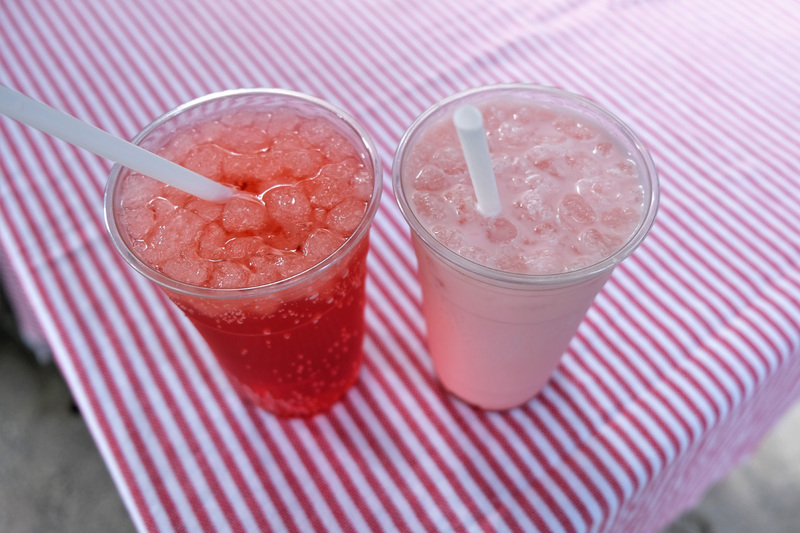 Hand-crafted Italian Sodas have long been a summertime favorite, available in two sippable and sparkling styles – with or without cream! A classic Italian Soda is made with cold, bubbly soda water and fruit flavoured syrup over ice in a range of flavours, such as Raspberry, Strawberry, Peach, Watermelon, and Passionfruit…as a few examples. Add cream to make any flavour into a smooth Italian Cream Soda, just ask! No matter how you enjoy your fruity bubbles, these are two refreshingly fizzy and fun drinks that will add some shimmer to your sunshine! 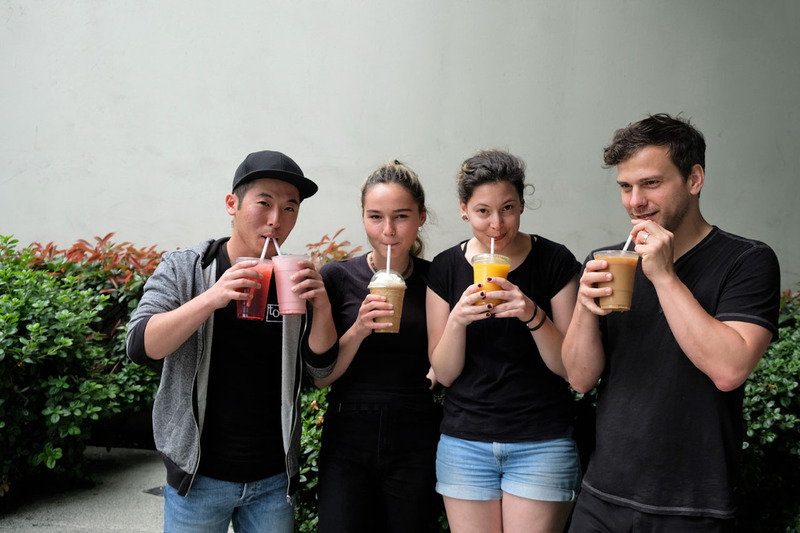 Our other popular summer drinks include fruit smoothies (mango or strawberry), Cappuchillo (coffee frappé), iced coffees, and iced loose leaf teas. 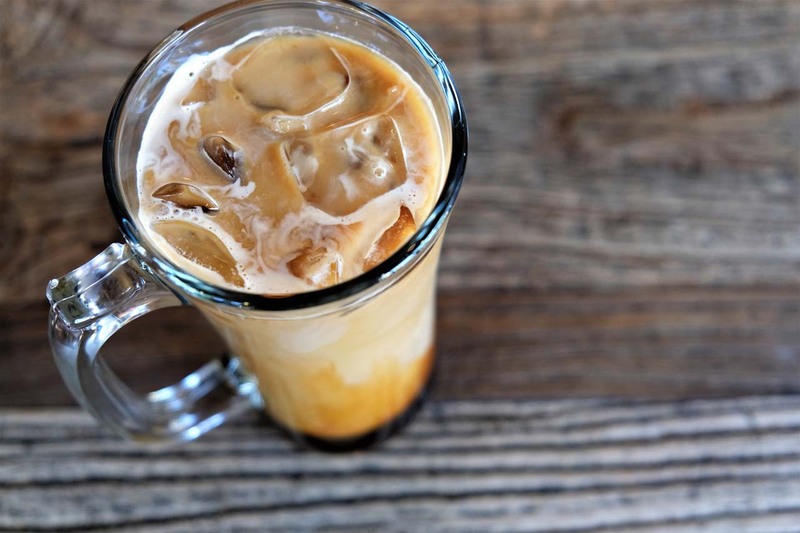 Unwind and satisfy your thirst at any of our 5 Trees Coffee & Roasting House locations! 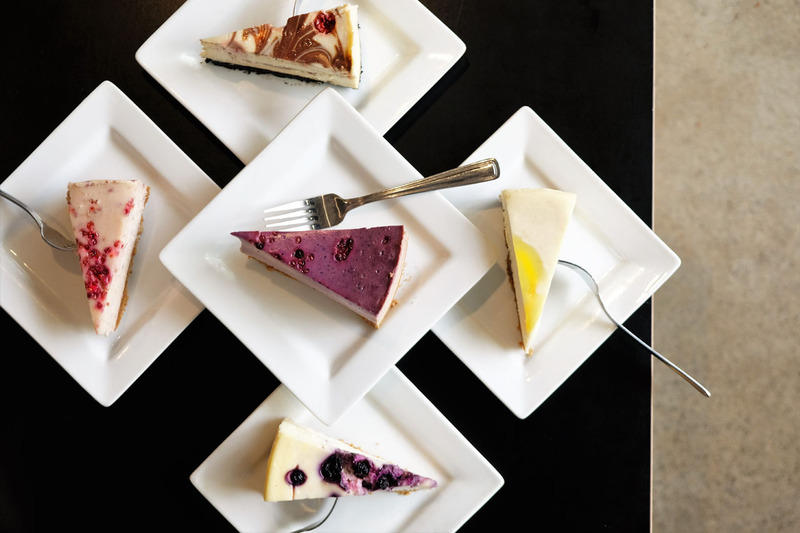 Cheesecake fans, rejoice! 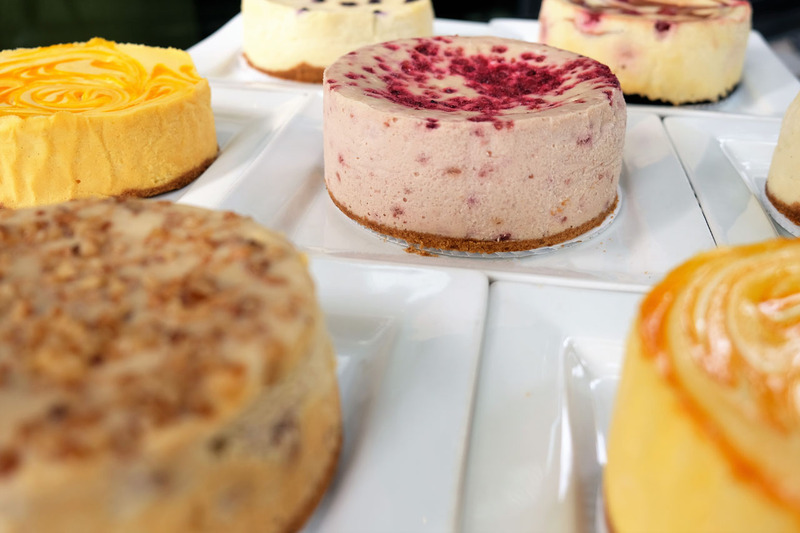 It’s time to celebrate our favourite and most lip-smacking food day – National Cheesecake Day, July 30. Here’s how – enter our biggest cheesecake giveaway of the year! 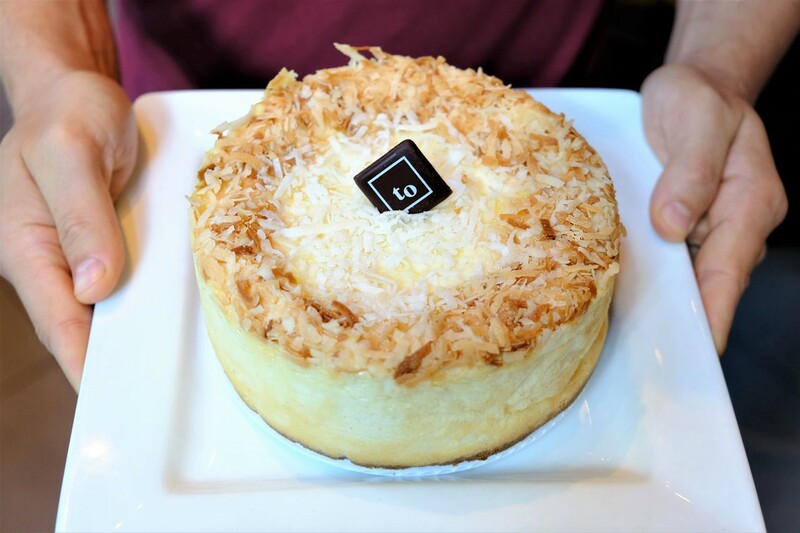 You could be 1 of 50 winners to receive a 6-inch cheesecake from Trees Organic Coffee and Roasting House. This cheesecake contest runs until July 30 and you can enter with 3 different options – at 5 cafes, on Facebook and/or via Instagram. 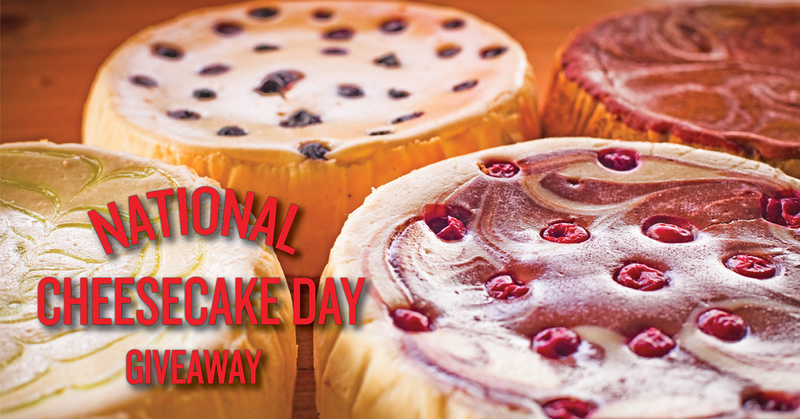 There are 50 prizes to give away; each prize is a 6-inch cheesecake with 9 flavour choices! 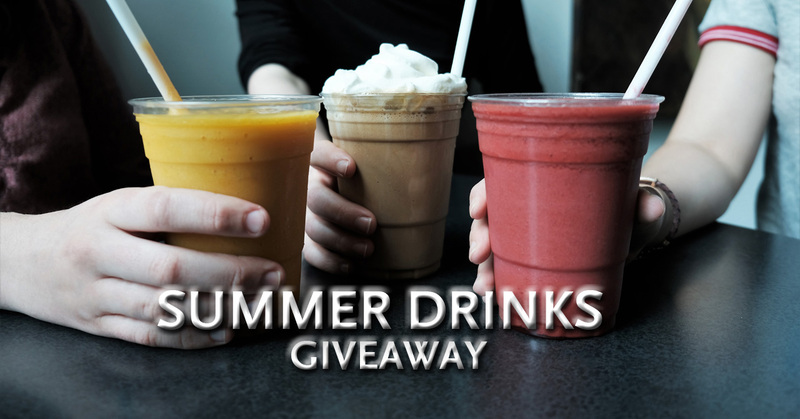 50 winners will be selected by random draw between all entry methods – Facebook*, Instagram*, and at our five cafes! Visit any or all of our five Trees Organic Coffee cafes in Vancouver. Complete a contest entry ballot at a café and drop it in the National Cheesecake Day Giveaway contest box. 3) COMMENT on the contest post by telling us the cheesecake flavour that you would like to win and who you would share it with. We’ve teamed up with Foodcouver for the Instagram entries. Go to the ‘National Cheesecake Day Giveaway’ post on the Foodcouver Instagram feed. Complete both steps. Increase your chances of winning by entering on Facebook, Instagram, and at all five café locations. One entry per person permitted for each entry method. This contest is run by Trees Organic Coffee & Roasting House. Contest ends July 30, 11:59 pm PST. Maximum one entry per person on Facebook, Instagram, and one entry at each of our 5 cafes. Participants must be 18+ and a resident of Greater Vancouver, B.C., Canada. 50 winners will be chosen by random draw between all entry methods. Each winner can only win one cheesecake in this contest. The contest is not open to employees of Trees Organic Coffee & Roasting House. Prize must be accepted as awarded. No substitutions. Not redeemable for cash equivalent. Each winner’s Greater Vancouver postal address will be required in order to mail a 6-inch cheesecake voucher (upto $28 value). 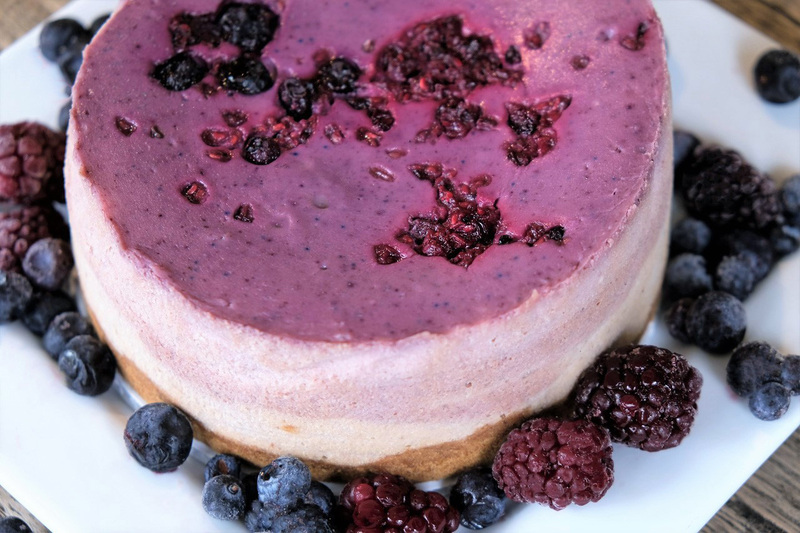 Trees Organic Coffee & Roasting House serves Vancouver’s Best Cheesecake, house-made from scratch in our bakery, and 100% organic coffee from single origin, fair trade beans that are roasted in-house. *This contest is in no way sponsored, endorsed or administered by, or associated with, Facebook or Instagram. By entering, entrants confirm they are 18+ years of age, release Instagram and Facebook of responsibility, and agree to Instagram’s and Facebook’s term of use. You are providing your information in the form to Trees Organic Coffee & Roasting House and not to Facebook or Instagram. The information you provide will be used for this contest and will not be shared with any other party outside of Trees Organic Coffee & Roasting House. Hurray for care-free summer days! It’s time to let loose and go wild for all the best things about summer, including our current feature – Mango Splash Cheesecake! 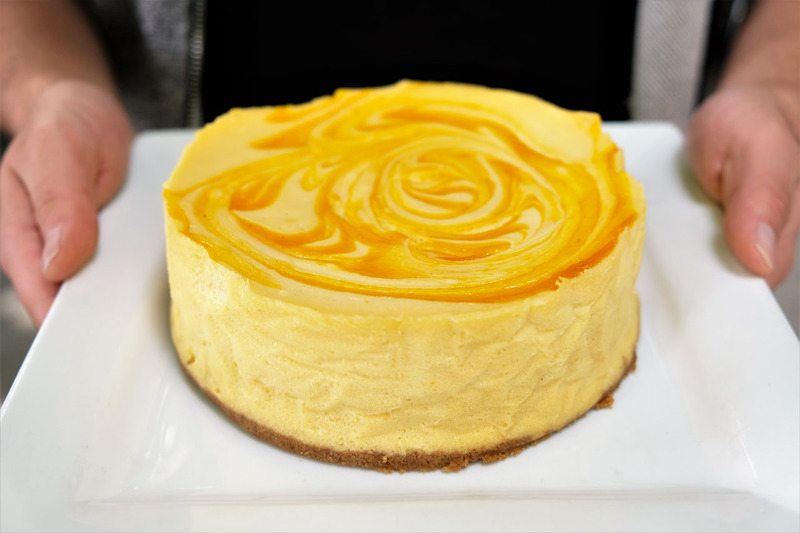 Causing quite a stir with its sensational juicy sweetness of mangoes, this cheesecake is a royal party for your palette and will kick things up supremely in the sunny days ahead! Fit For Taste Bud Royalty! 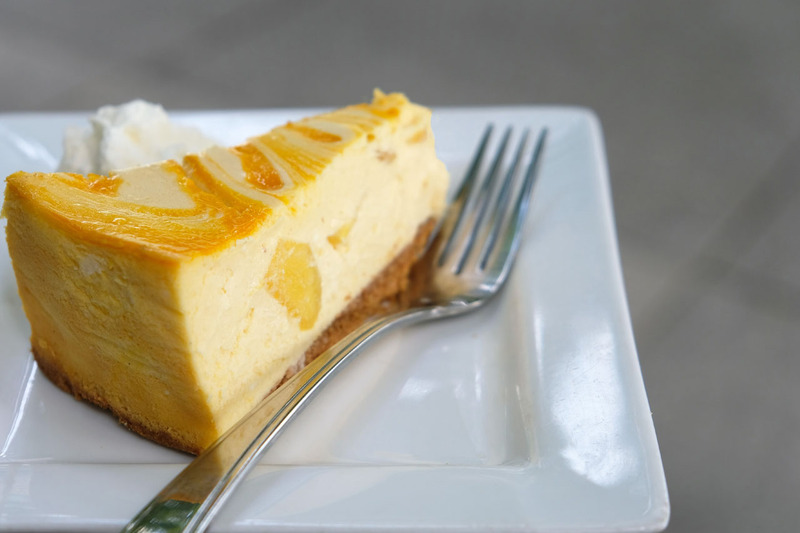 It’s no surprise we all go wild for this mango cheesecake, a summertime favourite that really makes a splash at our five cafes. Juicy and ripe mango morsels are combined with our smooth cheesecake filling that rests on an ever-so-crunchy golden graham crust. 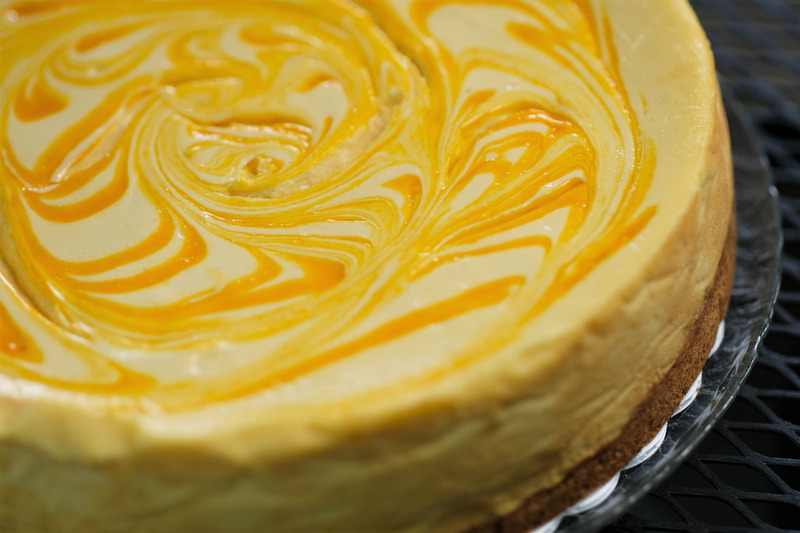 Sunny swirls and splashes of sweet mango coulis crown this Mango Splash Cheesecake as the most glorious summer dessert in the land. It is a regal treat fit for taste bud royalty! Well, that’s because mangoes are known as the King Of Fruits – unofficially, but we tend to agree! 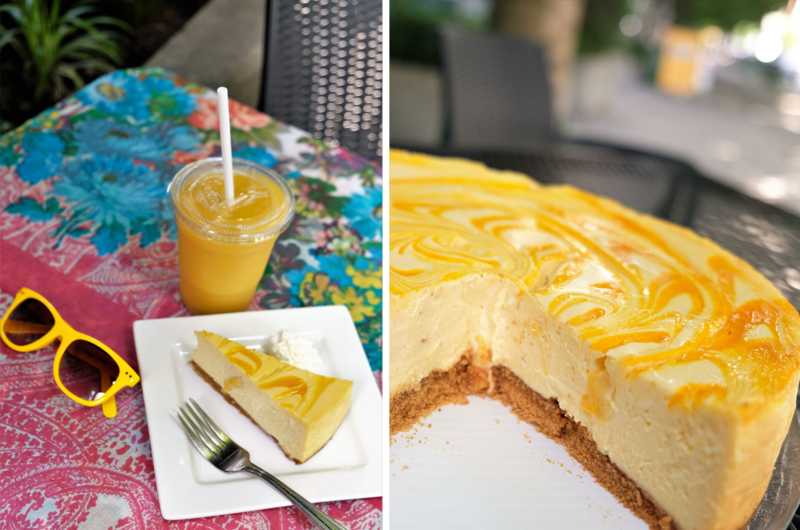 Go wild for our Mango Splash Cheesecake by enjoying slices at our cafes or make a splash at your summer parties by sharing a whole mango cake in 3 sizes – 6”, 8” and 10” – all made in house at our bakery. If you’ve a royal fan of mangoes then you can even pair your mango dessert with our frosty real fruit mango smoothie!